An ensemble of performers from St Christopher’s Services, Longford and The Visual Theatre Programme in Mermaid Arts Centre, Bray devised a theatre production under the direction of Gemma Gallagher of Shadowbox Theatre Company who created work that challenges expectations and perceptions about disability. Gemma, who has worked with Cirque du Soleil and Punchdrunk, guided this ensemble of actors to create a piece of theatre from the heart of the participants own reflections and experiences at all times finding imaginative and engaging ways of sharing their story and challenging preconceptions of what it is to be ‘other’. 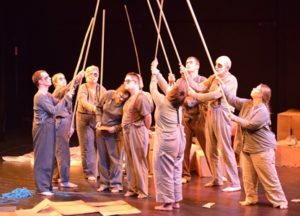 This theatre production was performed in both Longford and Bray, as part of a collaboration between Backstage and Mermaid. This project is supported by the Arts Council, Co Longford Arts Office and the Ireland Funds.